In many cases, the main entrance of your home commands the most attention from the street. 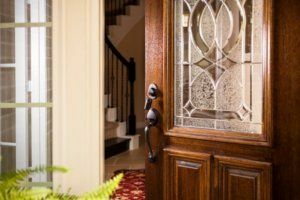 So when it comes time to selecting a new front entry door, it’s important to understand the various materials and style options available to enhance your home’s overall curb appeal. There are countless options for materials, panel and glass designs, grille patterns, sidelights and more available on the market today. The key is to take your time and work with a professional to show you the options. When selecting the material for your front door, you first need to consider cost, performance and design. Many designers today recommend fiberglass first because it’s one of the most energy-efficient doors on the market, especially thanks to its high insulation properties. 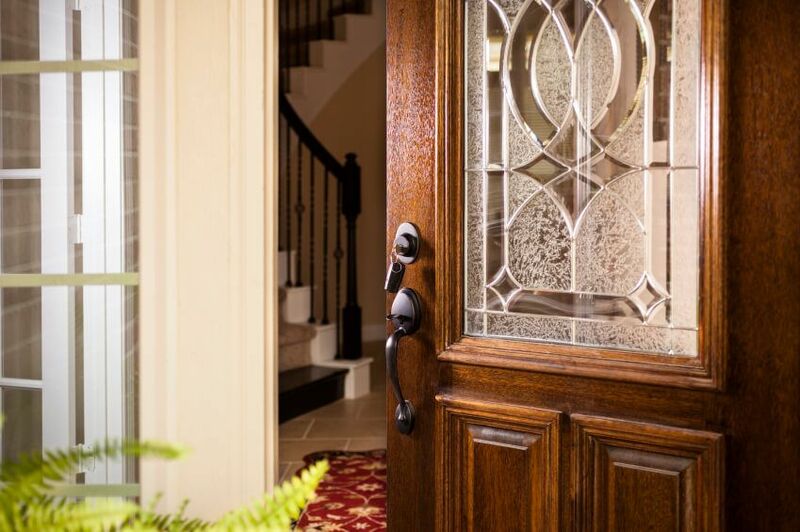 And because of fiberglass’ design flexibility and ability to mimic natural wood, you can easily customize your door to complement your home’s architectural style. No matter what “trendy” material becomes available on the market, there are always the homeowners who insist on “real” wood. This is no exception when it comes to entry doors, especially for higher-end homes whose owners are looking for the look and feel of authentic wood grains. The major drawback to wood products, as you may already be aware, is the high maintenance — as they can fade and crack. According to This Old House, “A steel door is your best bet if security and durability are top priorities.” Not only are they more robust than wood and fiberglass doors, but also they’re also easy to repair. Other material options include glass and aluminum. If you choose your front door color based entirely on the resale appeal of your home, you may end up being unhappy with your choice. Keep in mind: A neutral door color – like beige, gray or black – can look elegant, but if bright green is your favorite color and you want to use your front door for self-expression, why not test it out? Always consider any up-front costs and long-term costs when shopping for a new entry door. Factors to consider should include: energy efficiency, maintenance requirements and life expectancy of the door you are choosing. These areas will all impact how much your new entryway costs you in the long run. Republic West Remodeling installers are highly trained, providing you with top-of-the-line craftsmanship. Contact us today for door replacement in Scottsdale and other Scottsdale home remodeling services.